Everything and Anything about the Ocean! Hey there! Thanks for dropping by oceans52! Take a look around and grab the RSS feed to stay updated. See you around! Ocean Kayaking – Up Close and Personal! Why is ocean kayaking such a unique experience? Could it be that the way you are seated in the kayak makes you feel like you are part of the ocean? Could it be that you move so quietly through the water you hardly disturb the ocean life around you? Maybe it’s the fresh sea air and the endorphins released from powering your own vessel? The chance of seeing wildlife up close and personal creates excitement and a sense of adventure – for sure! There are guidelines for approaching wildlife. It is recommended that you give wildlife a100m distance when passing by or observing them from a kayak. 200m is advised for killer whales. There are times when they decide to come to you to see just what you are! I have had many very enchanting encounters with marine wildlife that have approached me in my kayak. They are the special memories of my kayaking adventures. Channel crossing in the Broken Group Islands can be long and arduous at times. This particular day we were slogging our way across the channel after visiting the sea arch. We heard a very odd sound – kind of a pffft pffft sound. We decided to raft up and just listen. We stopped and paddled our boats together when all of a sudden we were surrounded by five Harbour Porpoises! One of them was a little baby – he had more of pssst sound. We sat entranced for the next ten minutes while these amazingly curious creatures surfaced and dived all around our kayaks. They were very curious to investigate these strange floating objects that were in their yard. It was a very magical moment! Last summer on a guided tour to Seal Island we were passing by a headland when a very young, adventurous seal swam out to our group to play with us. We named him Charlie…. it seemed to suit him. He swam all around our kayaks, even upside down. He had no fear whatsoever. 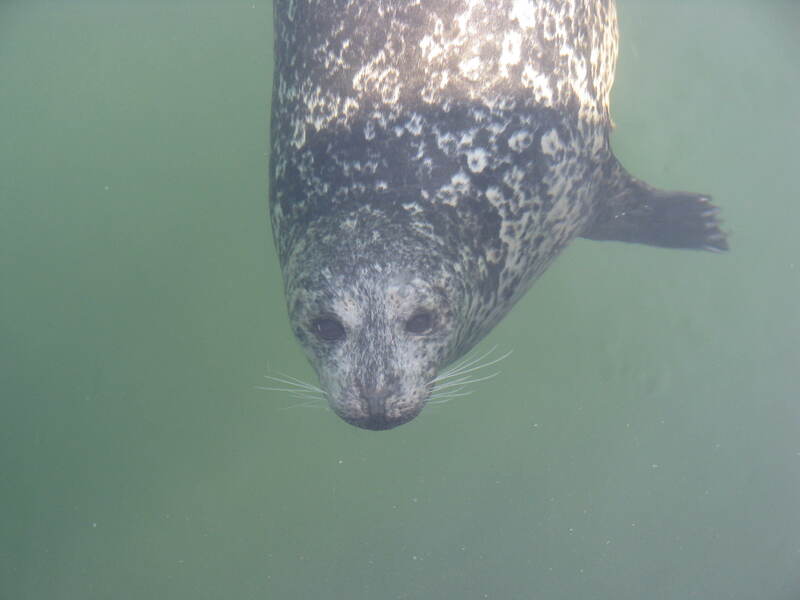 He would swim under the boats and come up and look at us as if to say “okay, now its your turn to do a trick”! Not long after his mother saw where he was and what he was doing, she sent him a strong warning with a huge slap of her front flipper on the water. He must have gotten a talking to because he never ventured close to our kayaks after that. It was very special for the clients on that tour. I had a “Mellow Yellow” moment a few years ago with a grey whale. Do you know the commercial I am referring to? Surfers, kayakers and boaters are all drinking Mellow Yellow when a BIG whale swallows them all. They all end up floating around in the whale’s stomach still drinking their Mellow Yellow. I had visions of meeting them all in there when I was paddling in Clayoquot Sound. I turned to say something to my paddling partner and only one boat length away a grey whale was swimming parallel to us!! It was surfacing and diving very gently along with us. I had the sense that he or she knew we were right there and that they were being extra courteous of these small creatures. I think I stammered”paddle faster” like that would make a difference – duh! We did make it safely to our next campsite with a wonderful story and adventure to share. All that evening the baby greys were playing and rubbing in the sand in the bay right in front of our camp kitchen. What a special kayaking day that was! Ocean kayaking is so unique and definitely worth trying. There can be some fear but the exhilaration of overcoming that fear is so worth it!! Share your ocean kayaking stories with us. We would love to hear about your adventures! « What’s Under the Dock? Top Ten Places to Paddle in Victoria – Hardest to Easiest! Oh so Cute Harbour Seal Babies! What’s in Your Dry Bag?